Strong yet safe cleaner removes oil, lubricants and grime from washable surfaces. Rinses easily. Safe for food-preparation areas. Nontoxic, nonabrasive, nonflammable and biodegradable. Exempt from OSHA and EPA special handling and personal protection requirements for hazardous materials. Application: Machinery; Tools; Applicable Material: Metal. Includes one 5 gallon pail. Simple Green rocks!... use it daily in our detail shop!! 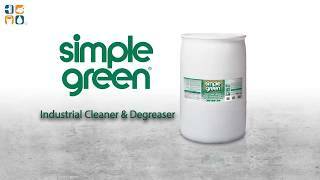 We use simple green to cut through grease here at our automotive shop. We need it in bulk which brought us to looking for a supplier. We've found ours!